Healing is a revolutionary act and we are here to awaken to the true nature of our own souls and the gifts we have to give to the world"
Join this powerful residential immersion in the potent rainforest land of Upper Wilsons Creek, to deepen your connection with nature, but more vitally, to AWAKEN THE WISDOM of your natural self: Inherently aware and alive. A dynamic field of existence. 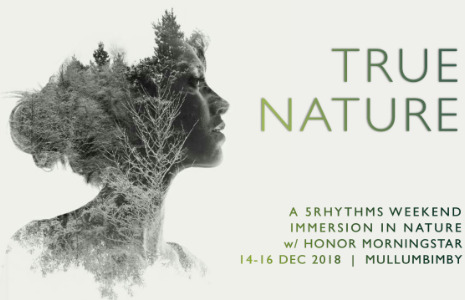 Supported by the powerful embodiment maps of the 5Rhythms, nourished by the EARTH, the flowing WATERS, FIRE light, and clean fresh AIR, we will listen to the immutable instinct that pulses through this body of work. A UNIQUE TIME TO RETURN TO THE EARTH, TO REMEMBER, REFLECT AND RECEIVE THE TEACHINGS OF THE YEAR PASSING. AND TO CRYSTALIZE AND POWERFULLY IMPRINT YOUR VISION FOR THE YEAR EMERGING. A residential weekend to get real and heal, through movement and stillness, silence and spoken word, inspiration and creation. WILDERNESS IS NOT A LUXURY. IT IS A NECESSITY OF THE HUMAN SPIRIT. FULLY CATERED with fresh nutritious organic plant-based meals. Honor Morningstar is a qualified 5Rhythms teacher, wildly committed to the path of healing and awakening through embodiment and self inquiry. She works with movement, meditation, massage, ceremony, shamanic practice, and prayer as medicines for metamorphosis.